Puyvast is one of the few companies who can offer a total package of specialized project transport, which can be adapted to the specific requirements of the client. A diversified fleet of suitably geared vessels available with the Group, and in-house experience of the technical department, represents the backbone of Puyvast's integrated project transport expertise. The Puyvast Team offers a great variety of value added services in the field of project and heavy lift transport, ensuring a reliable alternative to this trade, and those requiring a total turnkey transport. • Relocation of a chemical plant from Karwar to Egypt on a turnkey basis. • Offshore oil rig from Vizag to Oman. 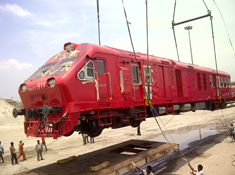 • Locomotives & Coaches from Chennai to Sri Lanka & Africa. 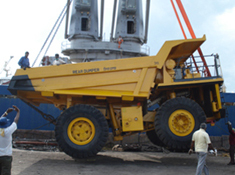 • Dumpers I Dozers I Excavators from Chennai to Syria & Tunisia as well as to South East Asian Ports. • Transformers from Chennai to Syria. • Transmission towers from Mumbai to Tripoli. • Chemical plant from Chennai to Aqaba. • Wind mill blades from Chennai to Kellysburg. • Construction and Mining equipment from Chennai & Kolkata to Africa and South East Asia. • Dismantled Cement Plant from Chennai to Lobito, West Africa.